Student filmmakers in the Bethel School District hope their documentary about crowded and aging schools will convince voters to pass a bond. SPANAWAY, Wash. — The Bethel School District has a complicated history with bond issues – only four have been passed in the last four decades, according to the district. In November, a bond to support the district failed by just .78 percent. “It was heartbreaking,” said Doug Boyles, Director of Communications for the district. Now Bethel is back on the ballot in February – and a group of students hopes to give voters more context on their needs. In the films, the interview classmates and staff on facility issues like leaks, stains, and overcrowding. The group described chronic traffic jams in the hallways. 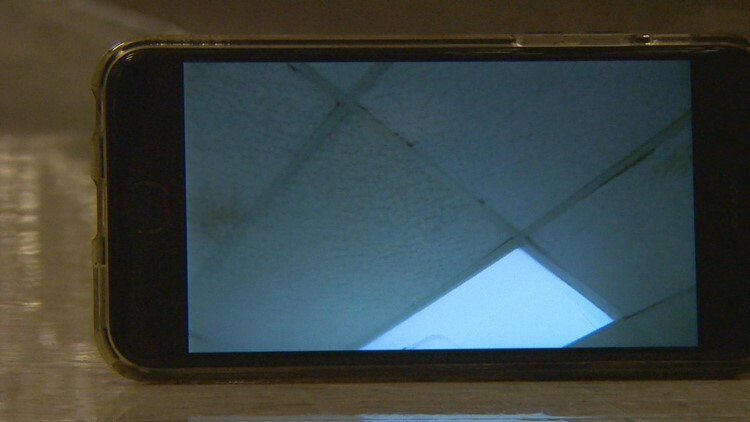 A shot from the students' documentary shows water stained ceiling tiles. They were inspired to create the film after the razor-close margin on the November bond. “It’s important because it shows how much we actually care,” said Rosell. The February initiative is critical to support the rapidly expanding district, Boyles said. The district expects to add about 300 students per year over the next decade. Already, 5,000 students are in portable classrooms, Boyles said. “It’s affecting student learning,” Boyles said. The February bond would fund two new elementary schools, a new Bethel High, and expansions or renovations on six other buildings. He said it’s difficult to communicate the tax impact to voters. He said the district hears from people that they want to vote yes, but feel taxed out. The students hope their film shows voters – and taxpayers – what they’re supporting. You can watch the students’ film here.